Yesterday I got back from a four day vacation which wrapped up the book tour/college sendoff/up-north vacation travelling flurry. It brings my total travel mileage to about 1800 miles in 11 days, or roughly 163 miles a day. It was insanity on wheels. 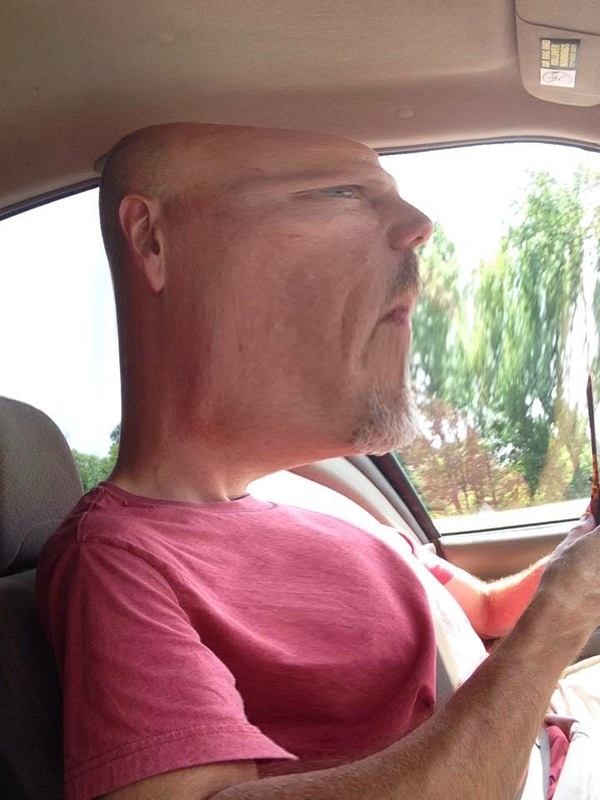 Feats of great posture wrecking stamina, and hours of road numbing boredom. If this is what the road life of a rock star is like, well, I'm glad I dropped those guitar lessons when I was nineteen. I like road trips as much as the next guy, but we all have our limits. It really is possible to get too much of a good thing. Rather than trying to synopsised all 3 trips in a single post, I thought I'd break it up into it's three parts. I call the first part a book tour even though it wasn't really a tour per-se. I think the tour goes on all the time, as I bring up the book to my next door neighbor, friends from high school, people at work, etc. It was as close as I could come up with given my limited time, money and geographic range. 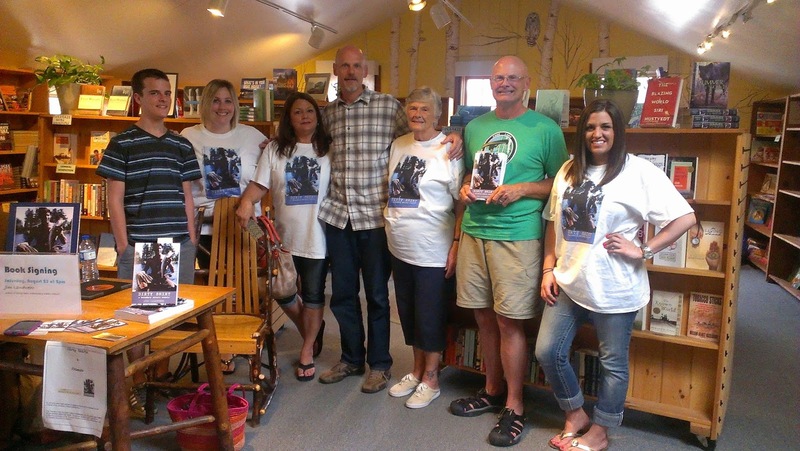 The ultimate destination of the trip was the Piragis book signing in Ely. I tell people it was more of an ambassadorial trip back to the area of the book's genesis because that's what it was. In addition to the book signing, I intended to donate my book to area libraries along the way as well as check in with the Duluth Fitgers bookstore to see how the book was doing. My son Ben accompanied me along on the trip, which made the trip a blast. We drove at our own pace, stopped when we wanted, ate where we wanted and just enjoyed each others' company. 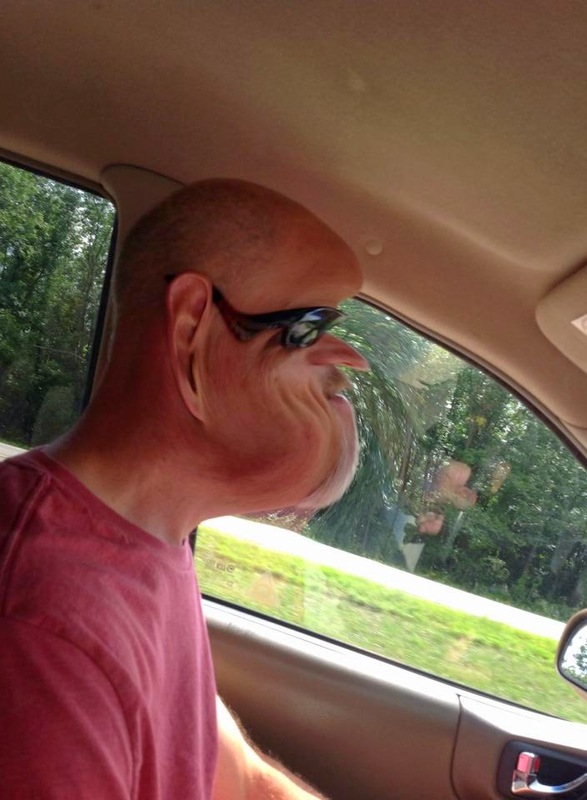 He used his iPad and PhotoBooth to create some crazy picture that cracked me up so bad I almost drove off the road. Here are a couple. It felt good to be laughing so hard with my son. The trip provided lots of "guy time", for which I am grateful. He was reaching for the A/C button and managed to ride on the shoulder zip-strips for a few seconds. We came upon a piece of retread from a truck tire in the middle of the road. He slowed to a dangerous 40 MPH or so, before I loudly declared that he needed to swerve around it, not stop for it for fear of being rear-ended. Yikes! He passed a car and before he was more than 3 feet in front of it, he changed back into that lane. Needless to say the guy re-passed us and gave us a quick lesson in lip reading and what I think was American Sign Language. When we got to St. Paul, we went out for burgers at Mickey's Diner in downtown St. Paul. Part of the reason we went there is because it is such a landmark, and I've always wanted to get him there. It was like stepping back in time 50 years. Despite it's unassuming interior, much of it original, the burgers were amazing. Definitely worth the trip. The next day we drove from St. Paul to Duluth. I checked Fitgers books and they were sold out of Dirty Shirt, so I left my card and asked the clerk if she'd reorder. She assured me she would. As I was driving into downtown Ely, I was shocked to look across the street and see my mom, sister and niece walking into a restaurant. After dropping my book at the Ely Library, I went back to where I'd seen them and they informed me that I'd ruined a good surprise. They and my other niece and four cousins had all driven up to Ely for my signing. Later at the signing, my brother Tom showed up as well. He had portaged into the BWCA the day before and camped a night, only to surprise me. In any case, it was great to see all of them. What a great show of support! It meant the world to me, especially when I saw that they had shirts made up with my book cover on the front. 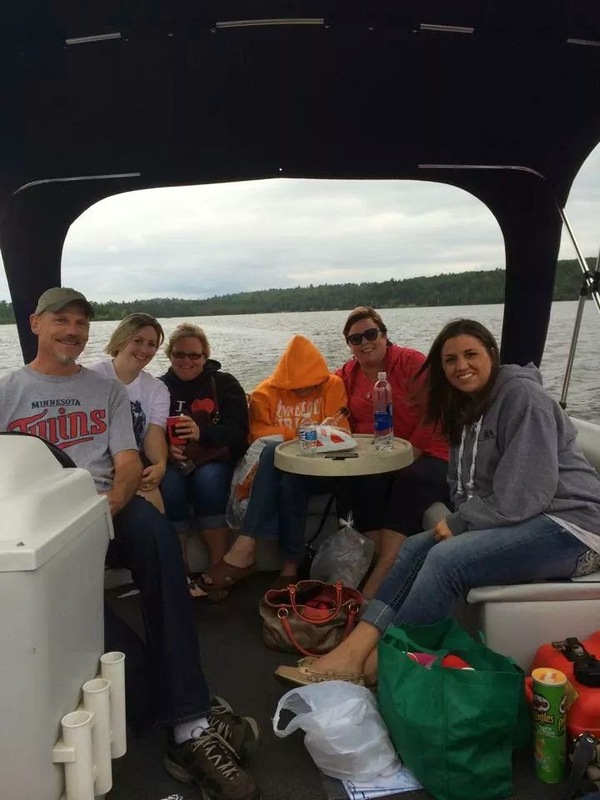 Later that night we all rented a pontoon and went for a ride on Shagawa Lake and then went out for dinner. I can't say enough about my family. 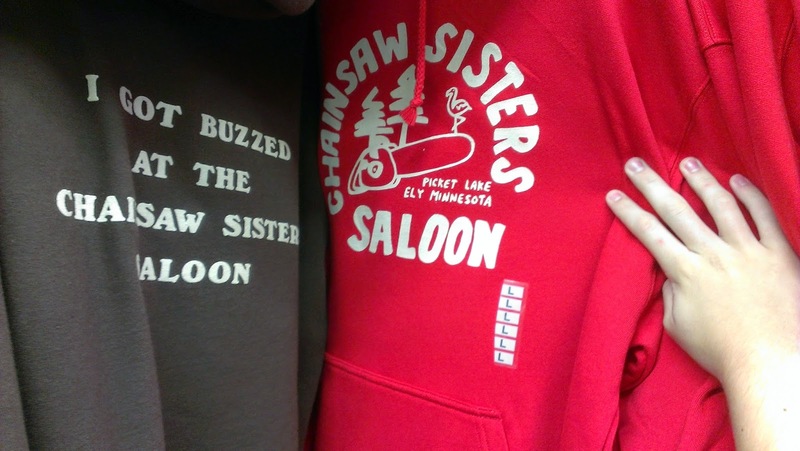 The next day Ben and I stopped in a couple of gift shops and came across a Chainsaw Sisters hooded sweatshirt in Ely Surplus. It stopped me in my tracks to know that some of these logo'd items were still out there. Took me back to 1990, for sure. After we left Ely, we wound our way through the state back to St. Paul. We stopped at Jay Cooke State Park, which was beautiful and then on to Taylors Falls which was also pretty cool. Overall the book tour portion of the 11 day road trip was phenomenal. I'll look back on my "mini book tour" with great fondness for many years. Dirty Shirt went home and was welcomed with open arms.